was an English actor, filmmaker, entrepreneur, and politician. He was the President of the Royal Academy of Dramatic Art (RADA) and the British Academy of Film and Television Arts (BAFTA). 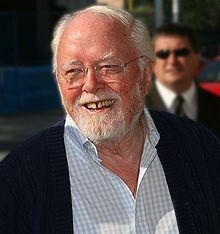 Attenborough joined the Royal Air Force during World War II and served in the film unit. He went on several bombing raids over Europe and filmed action from the rear gunner’s position. He was the older brother of Sir David Attenborough, a naturalist, documentaror, and broadcaster, and John Attenborough, an executive at Alfa Romeo. He was married to actress Sheila Sim from 1945 until his death.